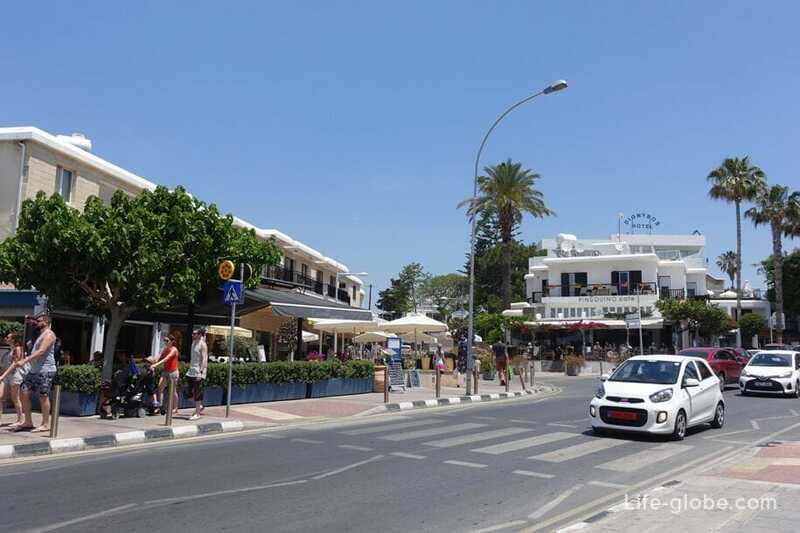 Paphos (Pafos) - the fourth in terms of population and one of the most beautiful resort towns of Cyprus, situated on the West coast of the island. In ancient times there were two places that were called Paphos: Old Paphos and New today Kouklia and new Paphos - Paphos current. The Apostle Paul visited Paphos in 45 during a missionary journey to Cyprus and in Paphos preaching the word of God, was captured by locals and subject to corporal punishment. Currently in Paphos is the famous pillar of St. Paul, according to the Scriptures, and next to which "punish" the Apostle. 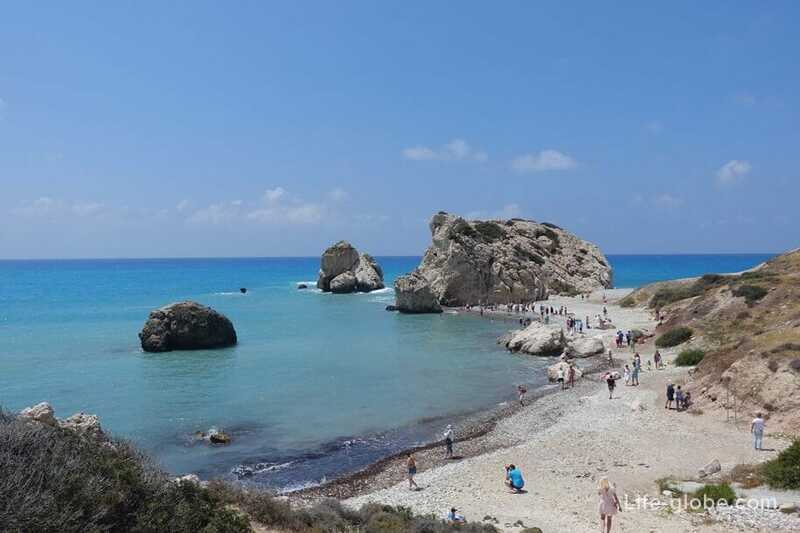 According to mythology, Paphos is the birthplace of the goddess of love and beauty Aphrodite. The many attractions of Paphos are the name of the goddess. So, in Kouklia can find Aphrodite's rock, the beach of Aphrodite and the temple of Aphrodite and the Akamas Peninsula are situated the baths of Aphrodite and Hiking trail of Aphrodite, the Paphos, on the Central promenade you can see the sculpture "the Modern Aphrodite". The modern town of Paphos is located on the Mediterranean coast, about 60 kilometers West of Limassol (the biggest port on the island). 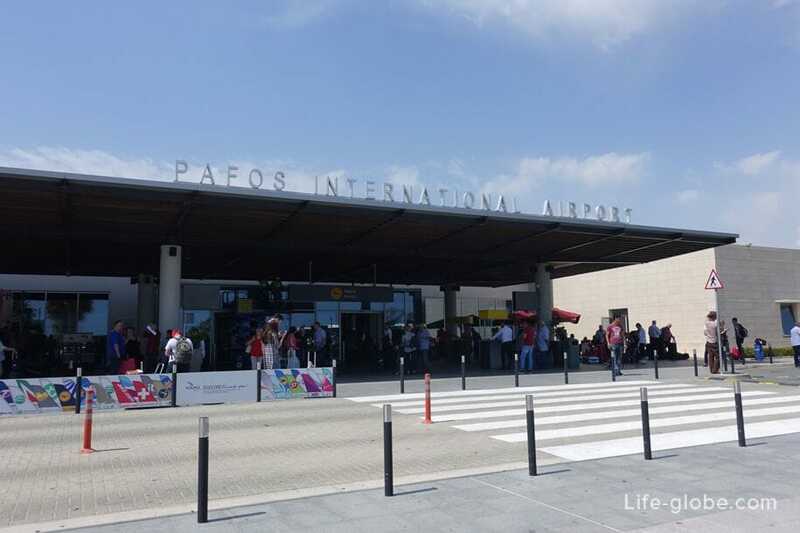 Paphos international airport is the second largest airport of the country and the only one that provides air transport services in the district of Paphos and surrounding area Limassol. 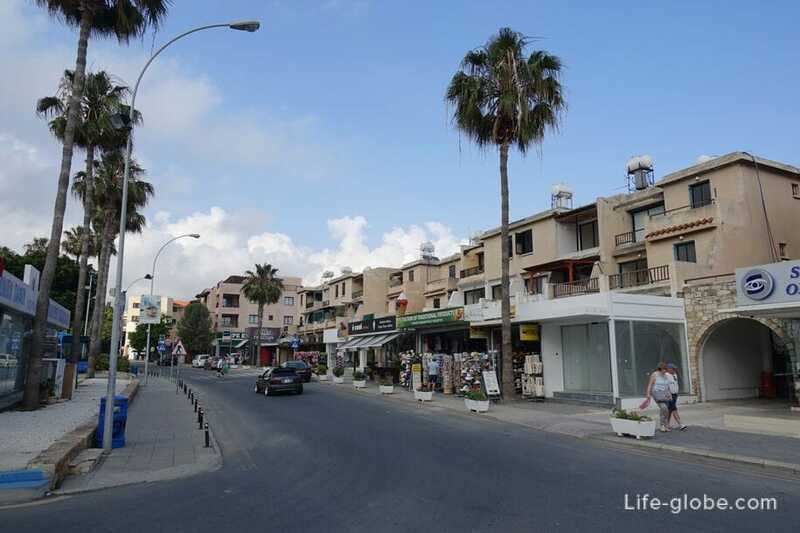 Distinguish top or Pano Paphos, known as Ktima - more modern residential area (city center) and Lower Paphos or Kato Paphos, the coastal area of the city. 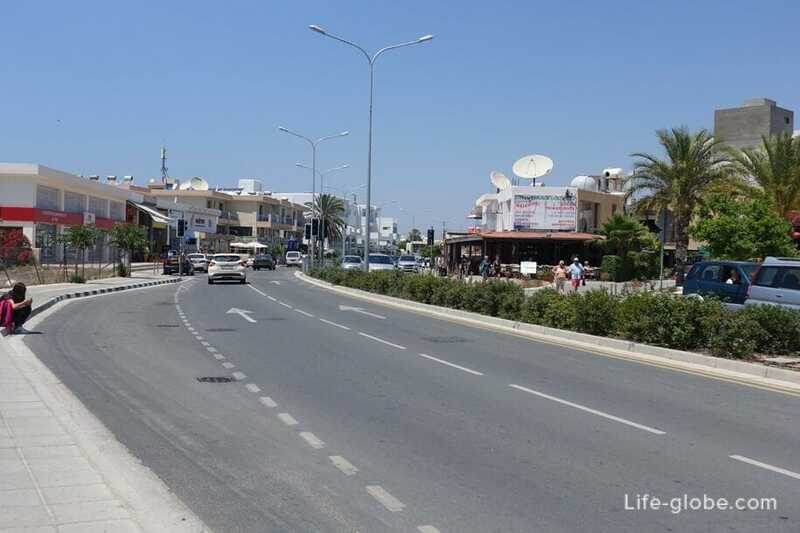 Exactly Kato Paphos is the most popular holiday destination among tourists. 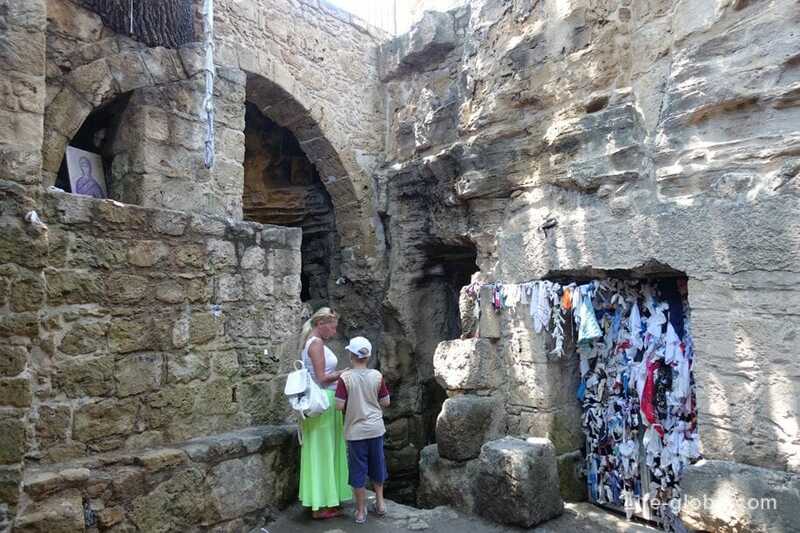 Also in Kato Paphos provides the largest number of attractions of historic and architectural value. 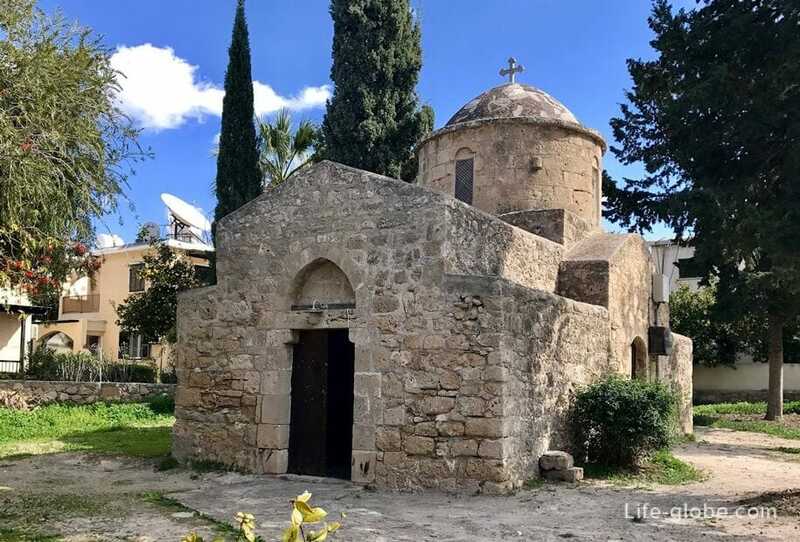 Thanks to the numerous ancient sites, and cultural and natural values, in 1980 the whole area of Kato Paphos was listed as a world heritage site by UNESCO. And in 2017, Paphos, together with the Danish city of Aarhus has been chosen as the cultural capital of Europe. And thanks to the developed tourist infrastructure, quite a high service, plenty of locations, availability of international airport and long coastline, where the many and varied beaches, many of which are awarded with Blue flag, Paphos, is the second most popular in Cyprus, after the Ayia Napa, beach destination. 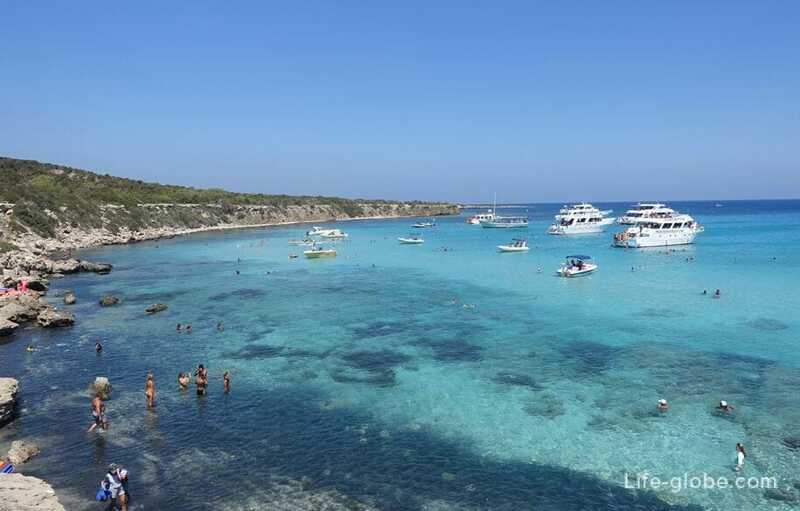 Cyprus - the most southern and therefore sunniest island of Europe, with warm sea water. 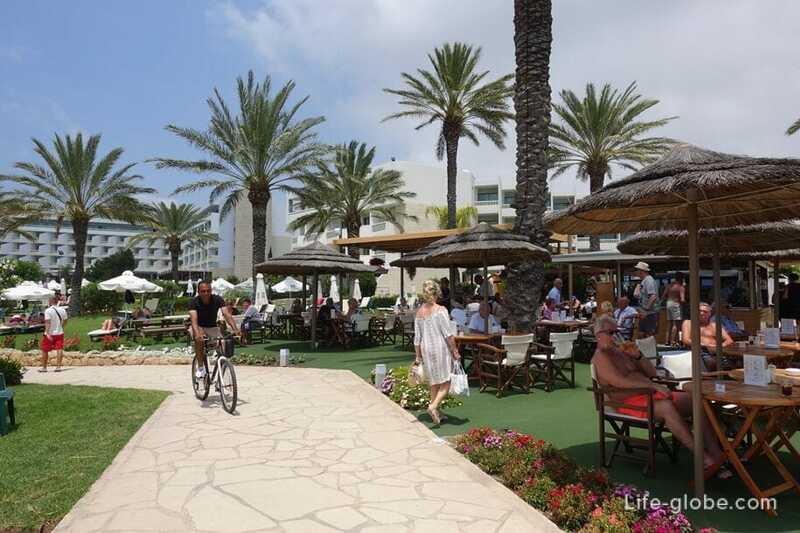 High beach season in Paphos starts somewhere in June and lasts until early October. The warmest month in Paphos - August. The average day and night temperatures during August are +26 - +32.2°C and +21 - +25.2°C, respectively. The maximum temperature can reach +35°C. The warmest sea in Paphos is also in August. The average sea temperature this month is +26 - +28.4°C. the Sea water begins to warm in early may, and rapidly gaining temperature. However, in the first half of may the temperature quickly creeps up when sea water is still cool. 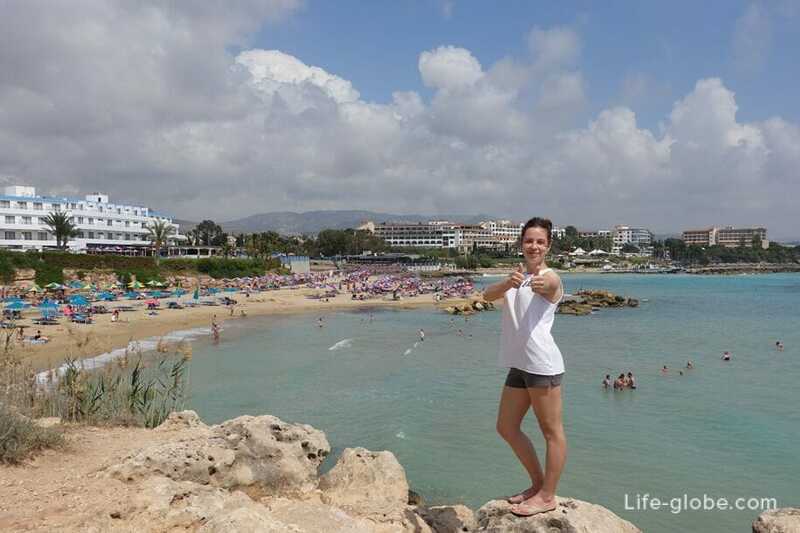 Local recommend to visit Paphos, with the aim of beaches, from late August to late September. 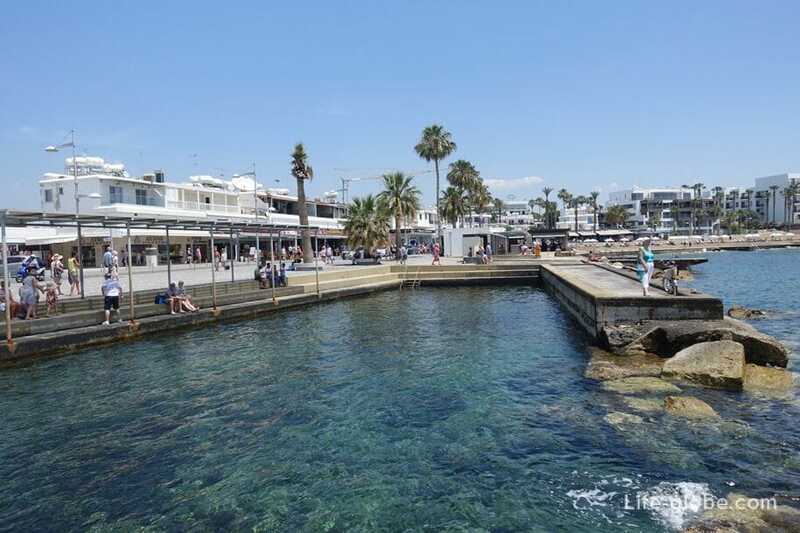 The off-season and even the winter months are also suitable for holidays in Paphos, swim in these seasons will be resolved, unless the unit hardened and the brave, and go for a stroll along the sea and sightseeing in these months for you. Especially in these months, tourists few, and the prices are the lowest. The most rainfall happens in the period from mid-November to March. Snow is rare, but still in the winter months can fall, and then quickly melt. Weather - the lady is very unpredictable, year on year is not necessary, therefore, for a more comfortable vacation, check the weather before you visit Paphos. In the high tourist season on the beaches of Paphos there is all necessary infrastructure: sunbeds and umbrellas, toilets and showers, rubbish bins and changing rooms, rescue rigs, on some beaches dedicated space for sports and water activities, there are playgrounds. Lifeguards with lifesaving equipment and first aid are on the beaches from April 15 to October 31, from 11:00 to 17:30 hours. The average cost of renting a sunbed or parasol - € 2.50. It is a concrete beach with a wide wooden deck and concrete piers equipped with ladders, for a more comfortable descent into the water. Beach Vrysoudia B is a small and narrow beach. On the beach mostly dense gray sand, sometimes mixed with pebbles. The beach is cleaned regularly. On the beach there are algae. 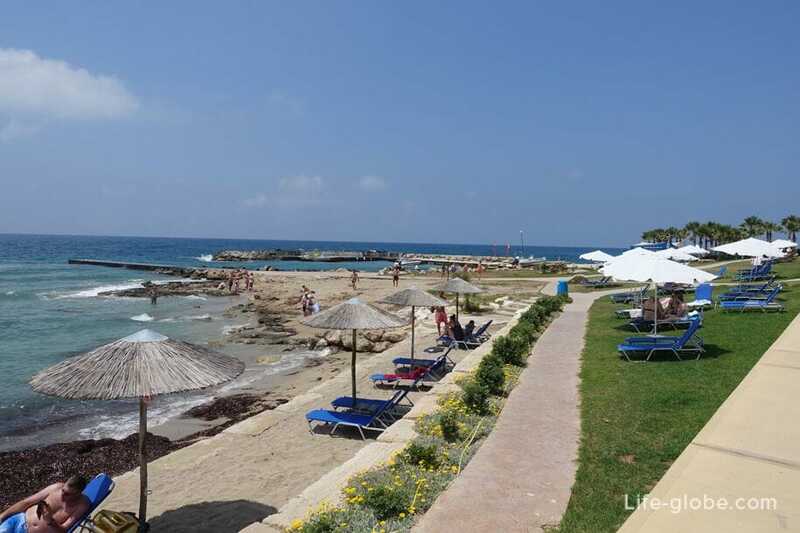 Beach SODAP is considered one of the best beaches of Kato Paphos, as well as one of the main beaches located close to the main road - Poseidonos Avenue. The length of the beach is 300 metres away. The beach is mostly fine sand of gray color, sometimes mixed with gravel and boulders. The beach is cleaned regularly. On the beach there are algae. 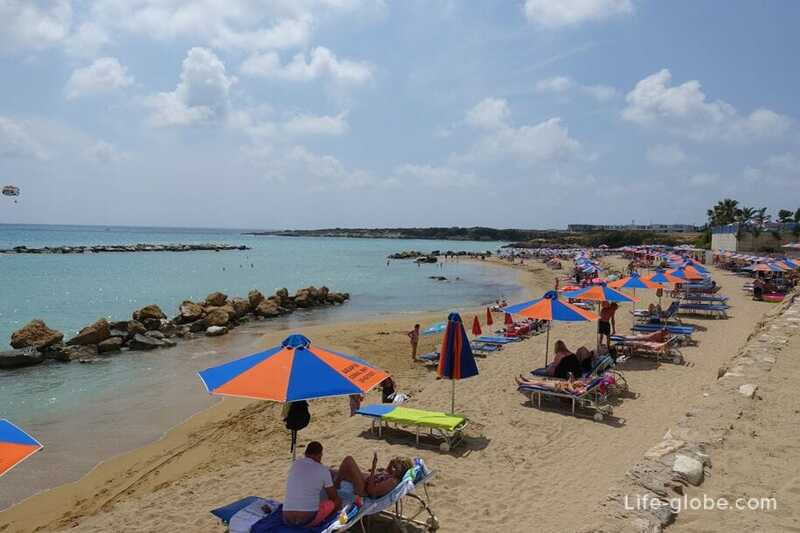 Faros beach - public town beach, located in the northwestern part of the coast of Paphos. It's pretty wide and spacious beach. The beach is 400 metres away. On the beach the sand is light gray, sometimes mixed with pebbles and stones. Sea water is clean, the bottom is not very convenient - sandy-stony, also in the water is the abundance of algae. For a more comfortable entry into the sea the beach has a concrete pier with a ladder. 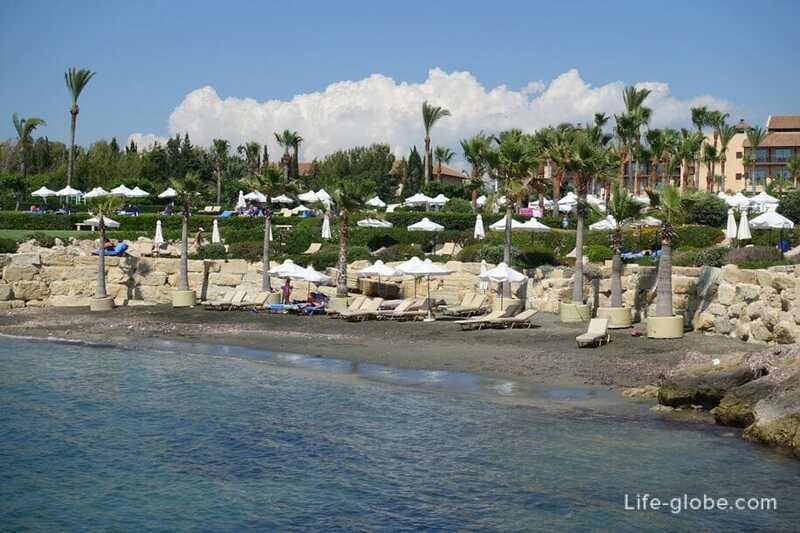 Refined green territory of hotel Kefalos is a complex, which has all the necessary infrastructure beach. In the complex: lovely two-storey building, walking paths, a promenade with benches for relaxing, there is a small Church. 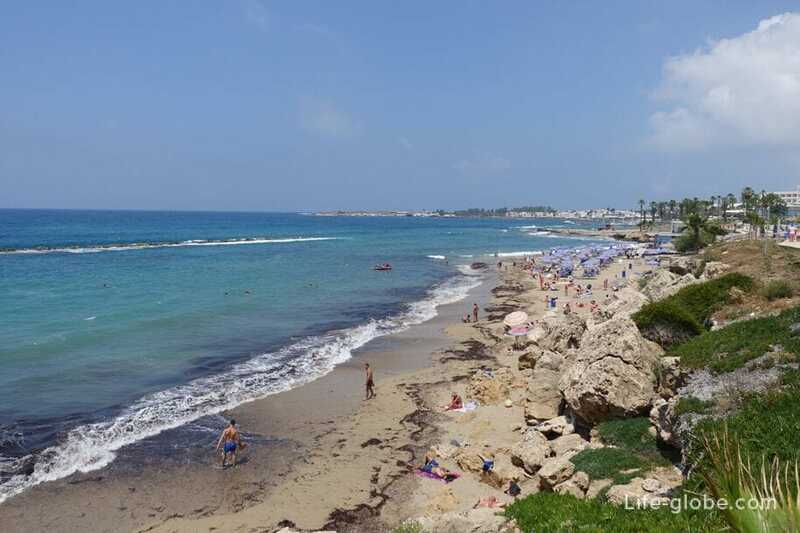 The beaches of Geroskipou are one of the best in Paphos. Near most of the beaches of Geroskipou, on the first line located hotels with direct beach access and a landscaped garden. 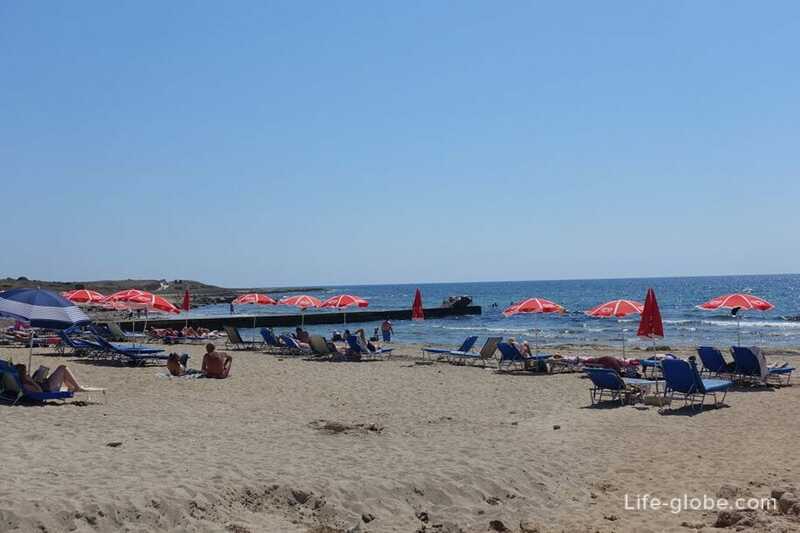 Special attention is given to Coral Bay - beach-tourist area, which has already become a private resort located in the South-Western part of the municipality of Peyia, 12 kilometres from the centre of Kato Paphos (North coast). Coral Bay is famous for its sandy beaches with calm and clean sea waters, as well as a developed infrastructure beach and the gentle sunset in the sea. In Coral Bay there are two equally attractive beach of the namesake beach of Coral Bay and the beach Laourou. 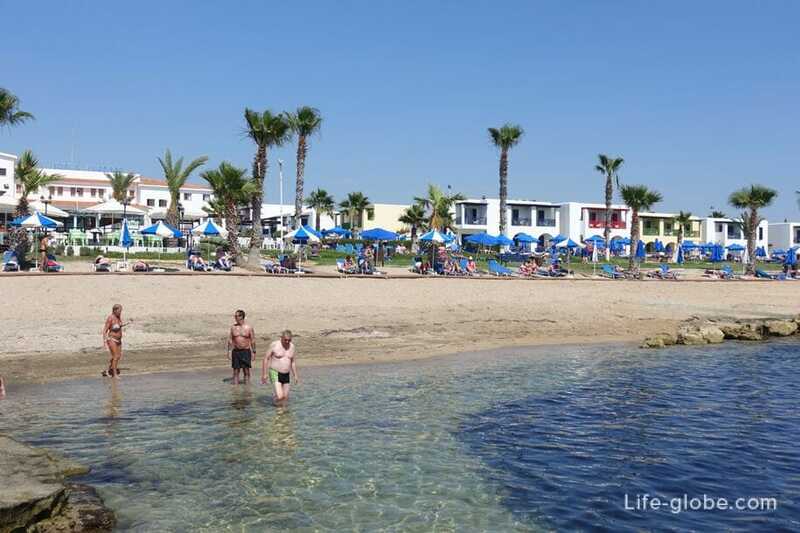 These beaches are Tops the best beaches on the West coast of Cyprus for a holiday with children. 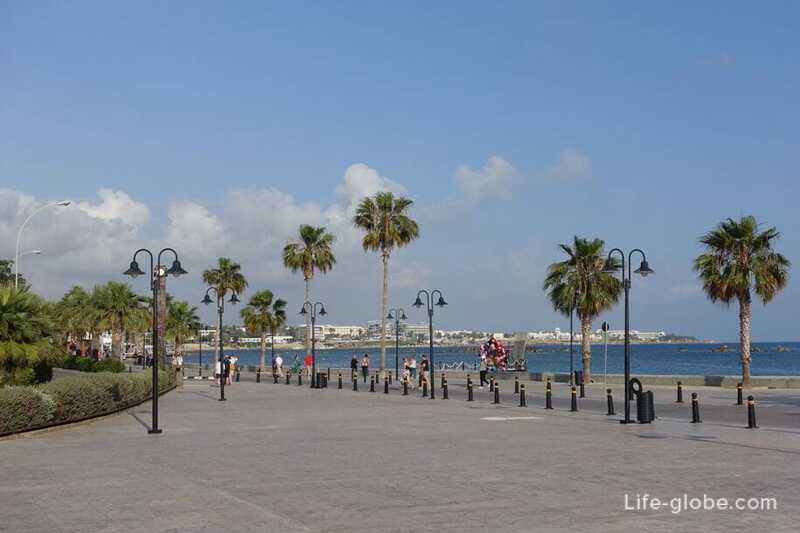 In addition to sightseeing, the main place for walks, leisure and evening get-togethers in bars and restaurants is Paphos promenade promenade. 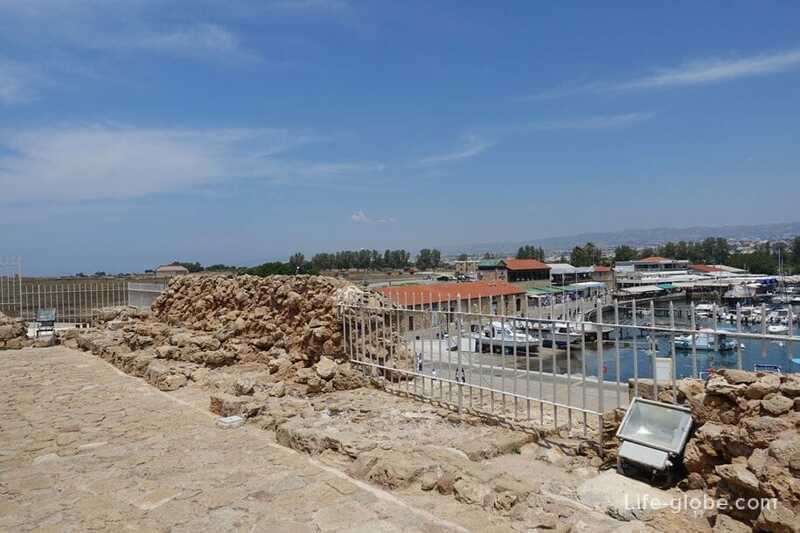 The Central part of the embankment originates from Paphos castle is near the harbour and central area of Kato Paphos. 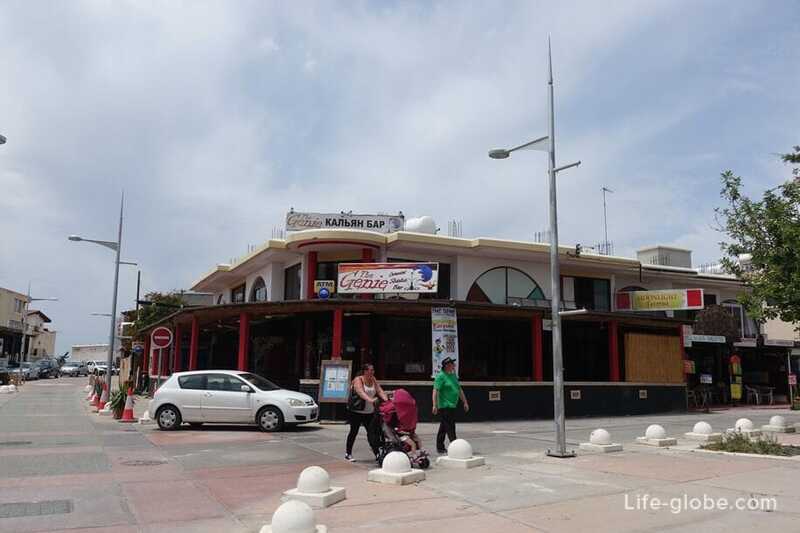 In this part of the promenade, plenty of cafés and restaurants. 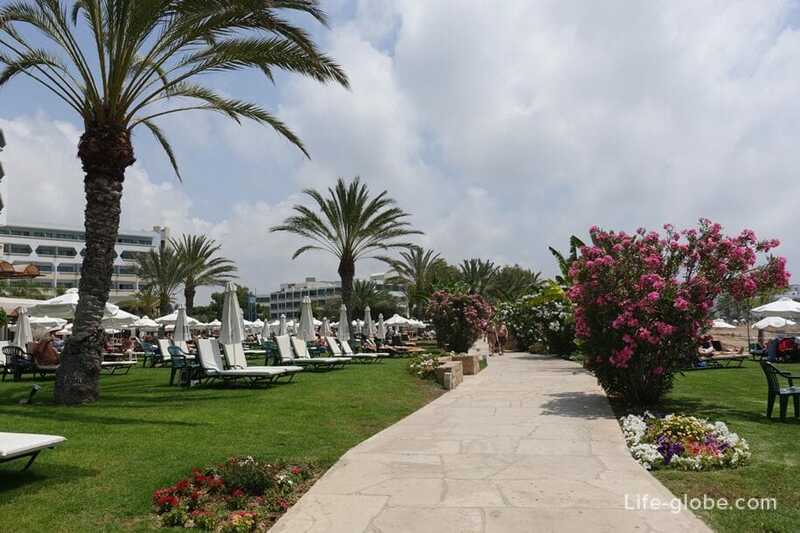 Further, the seafront of Kato Paphos blends in with the waterfront of Yeroskipou, where a large part of walking coastal path runs alongside the hotel, with direct access to the beach. And, of course, the promenade Yeroskipou is buried in flowers and greenery. 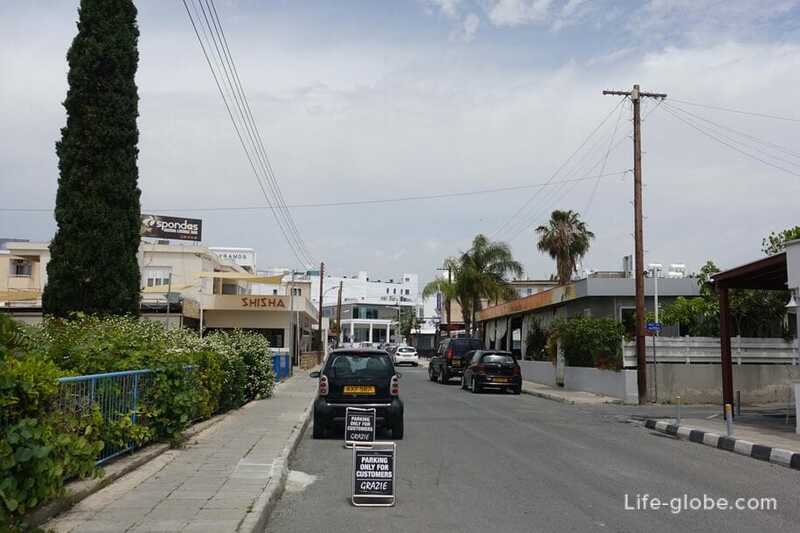 So-called "Bar street", and rather a few small streets near the centre of the promenade of Paphos, a little higher than that - the main street of Kato Paphos for evening gatherings with a glass of beer or wine. There are an abundance of restaurants, cafes, bars and hookah cafes where in the evenings you can see the company of young people and not so leisurely smoke hookah, sipping hot drinks and something fun talking. Also there are discos and night clubs. 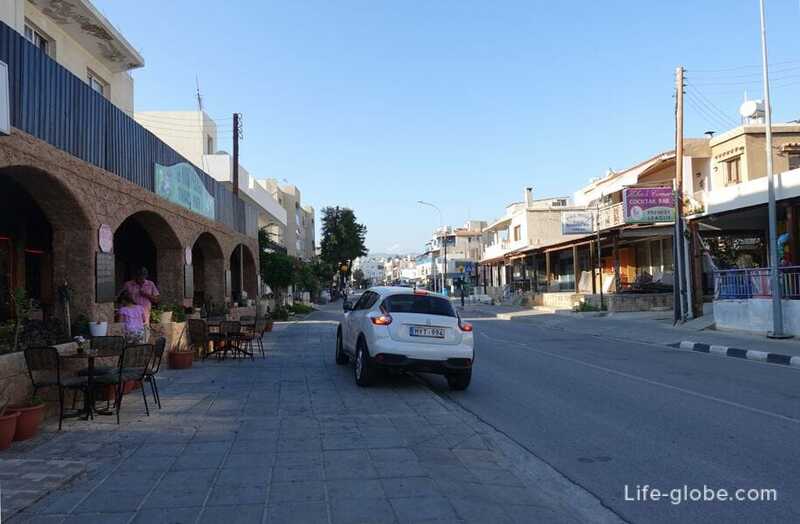 Landmark: streets Pafias Afroditis, Ayias Anastasias, Constantias and nearby streets. Another tourist street is the street of the Tombs of the Kings (Tombs of the Kings Ave), which runs above the sea level, leading from the shopping Kings Avenue Mall to the North. 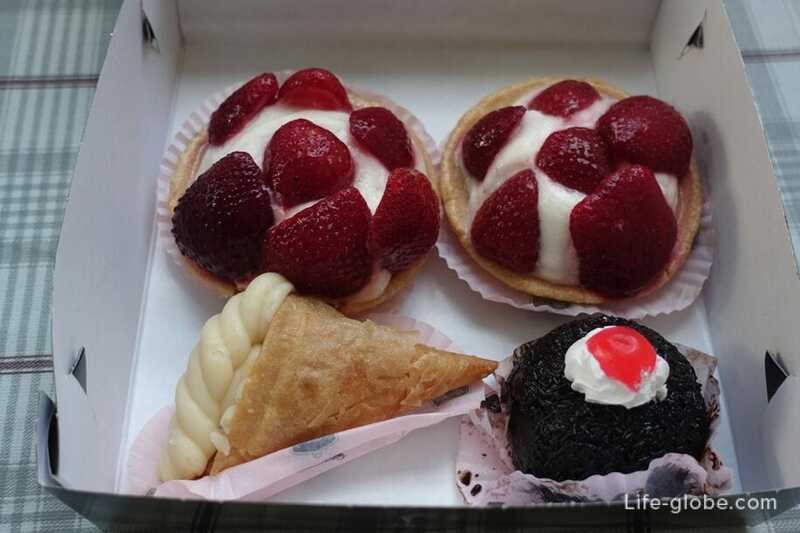 Along the street: cafes and restaurants, tour agencies and bars, hotels and apartments. This street will lead to the Royal tombs. 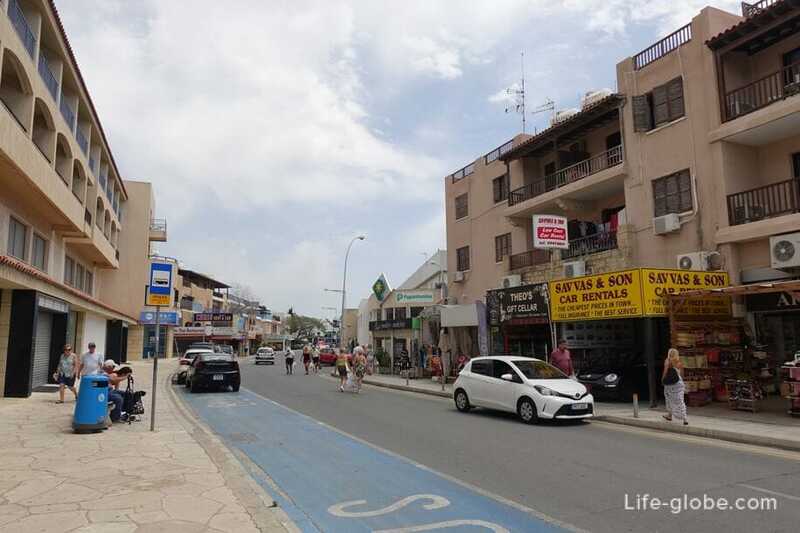 Location Geroskipou is a street Poseidonos Avenue, along which lined cafes and restaurants, shops and stalls with Souvenirs, sweets and other goods. 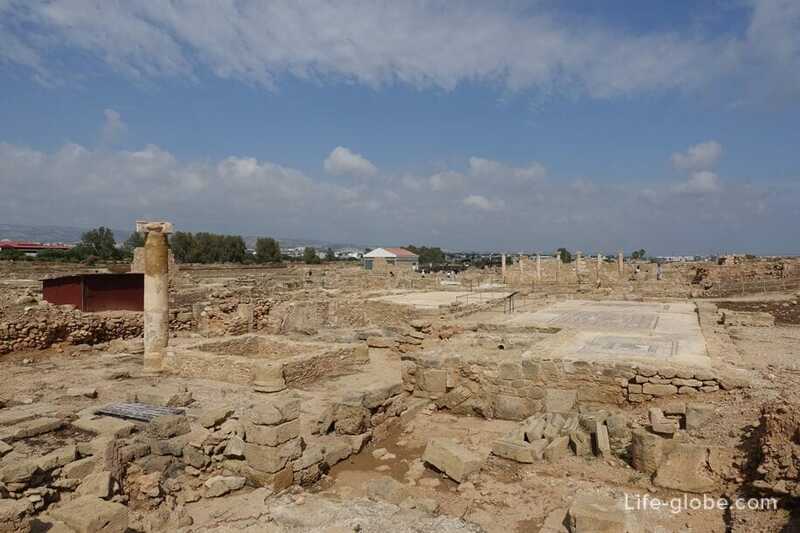 The basis of the attractions of Paphos is the archeological objects located in Kato Paphos, near the harbour. Paphos Castle is a medieval Fort situated on the ancient mole in the Western part of the port city. 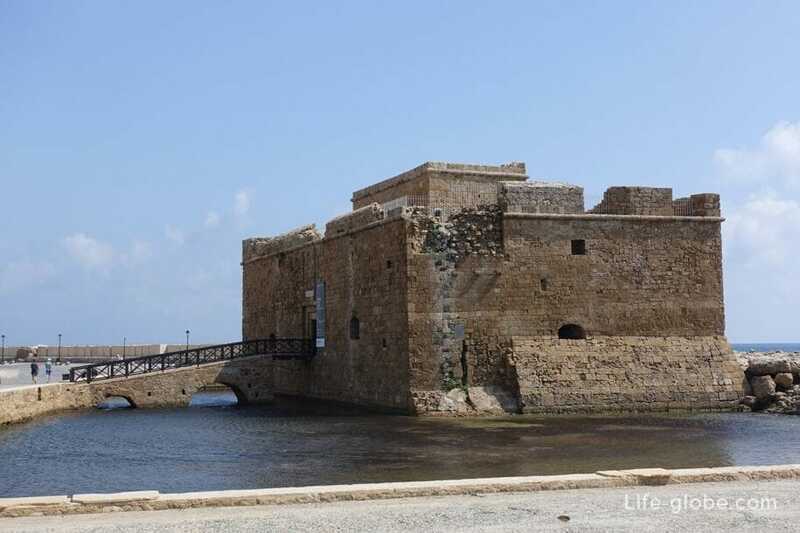 This medieval fortress in the past was a part of the coastal defense system of Cyprus. At present, the Paphos castle is a small rectangular stone structure, consisting of one tower with two floors. 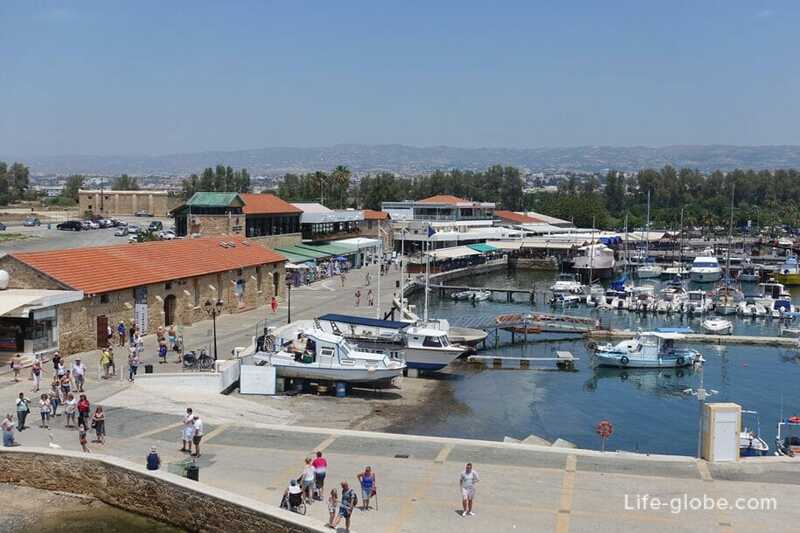 For a fee you can climb to the second floor, with a 360 degree view and represents an open platform, which offers wonderful views of the harbour and the main promenade of Kato Paphos and the Mediterranean sea. 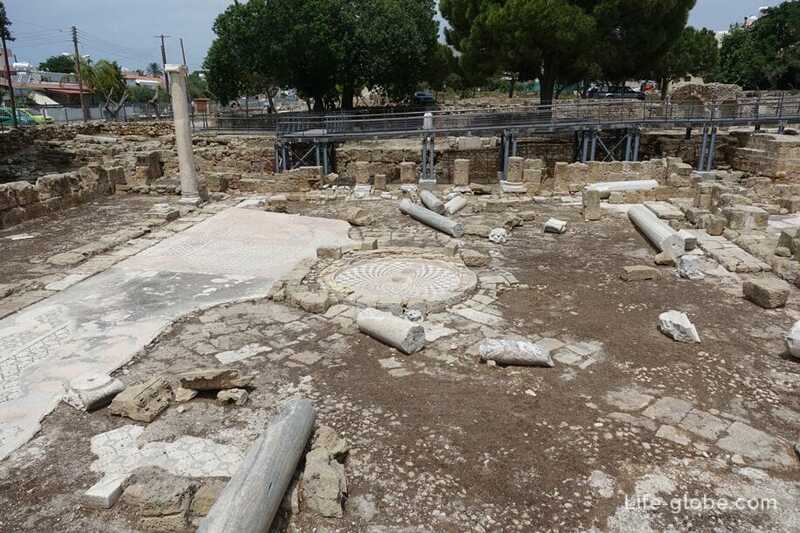 Archaeological Park of Paphos is a site of objects of several ages, located under the open sky near Paphos harbour. The complex of the Archaeological Park includes: the ruins of a castle Forty columns, four villas (House of Dionysos, House of Aion, House of Theseus, House of Orpheus), which preserved mosaic floors, as well as the Agora, the Odeon, the Asklepeion and the latest construction of the Park is the lighthouse. - and the main attraction of the complex is the Church of Panagia Chrysopolitissa, built in the 1500s on the ruins of earlier shrines. 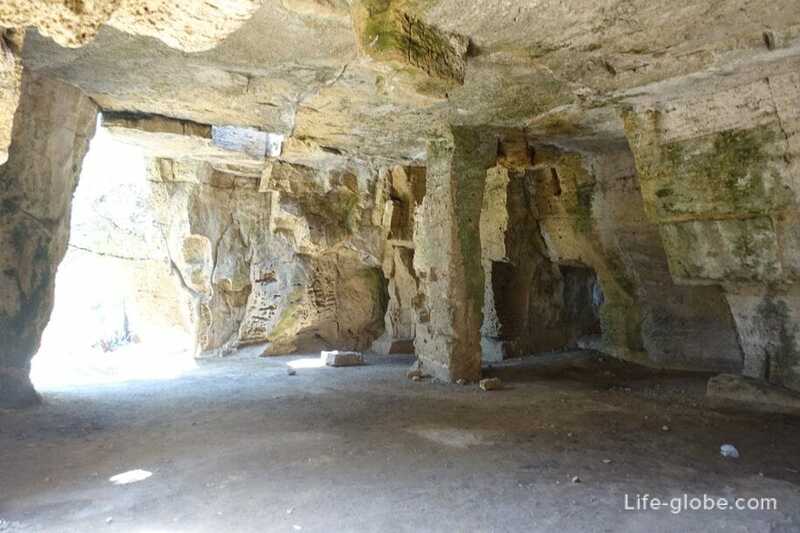 Currently, the catacombs is one of the Christian shrines of Cyprus, which is a small underground paleo-Christian complex, consisting of several small caves, partly carved into the rock formations. 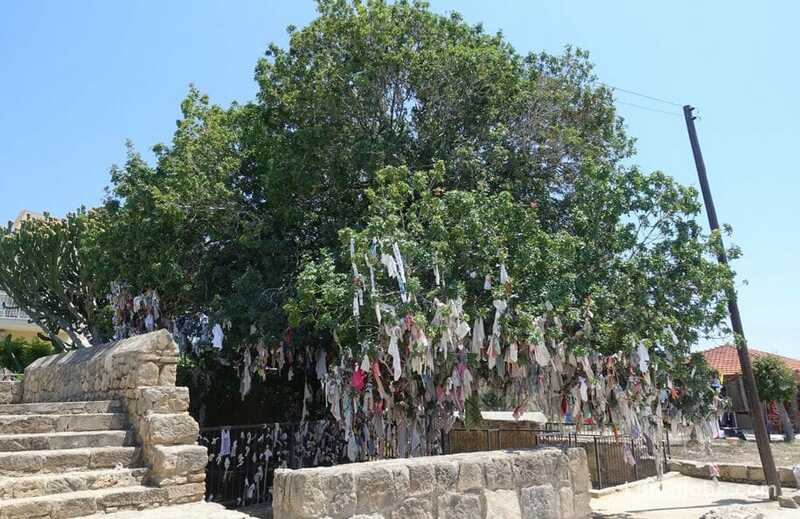 Near the entrance (descent) into the catacombs growing pistachio tree, the branches of which are tied with colored ribbons left by parishioners and tourists in the hope of healing from diseases. 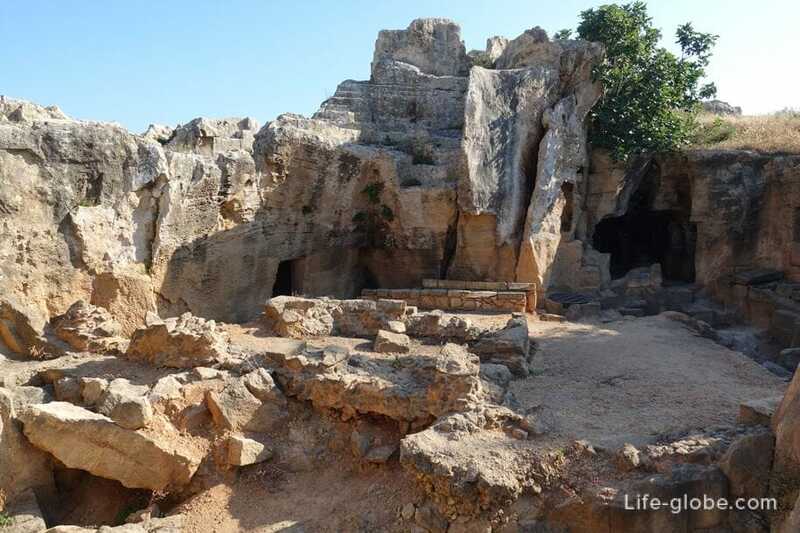 Mountain Fabrica (Fabrica Hill) lime mountain (small hill) where in the depths of which are concentrated such historical sights of Paphos such as: quarries, catacombs of St. Lambrianos, cave of the lovers and the amphitheatre. Tombs of the Kings is a necropolis located to the North along the coast from the harbour of Kato Paphos. 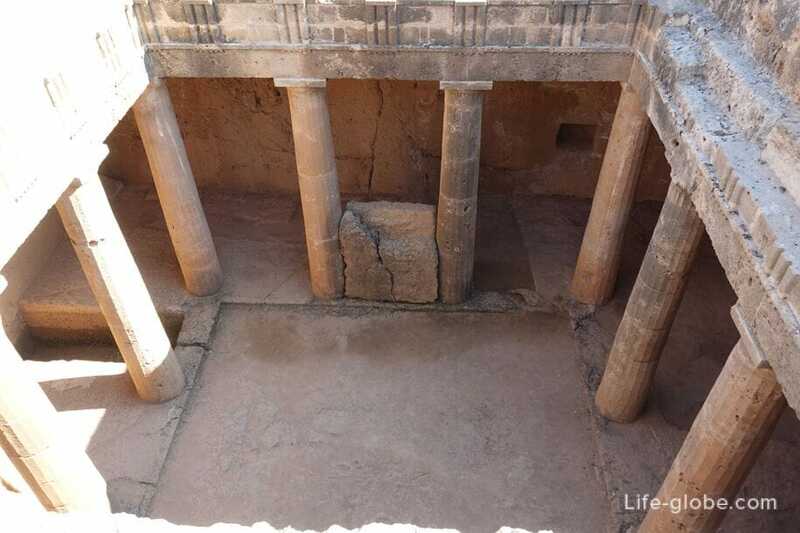 The necropolis was built during the Hellenistic period (3rd century BC), to meet the needs of the elite of Nea Paphos. Currently, the Tombs of the Kings is a very vast territory under the open sky, fenced, on which are the remains of underground burial chambers, partially or completely carved into the rock formations. The history of the Church of Theoskepasti comes down to the early 10th century. The temple was built on a small cliff, which made the Church a recognizable and clearly visible even from a distance. Currently at the base of the Church, it is also possible to see part of the old rocks. Byzantine Museum, ethnographical Museum of Paphos art gallery, the district archaeological Museum of Paphos, and Byzantine Museum and folk art Museum in Geroskipou. 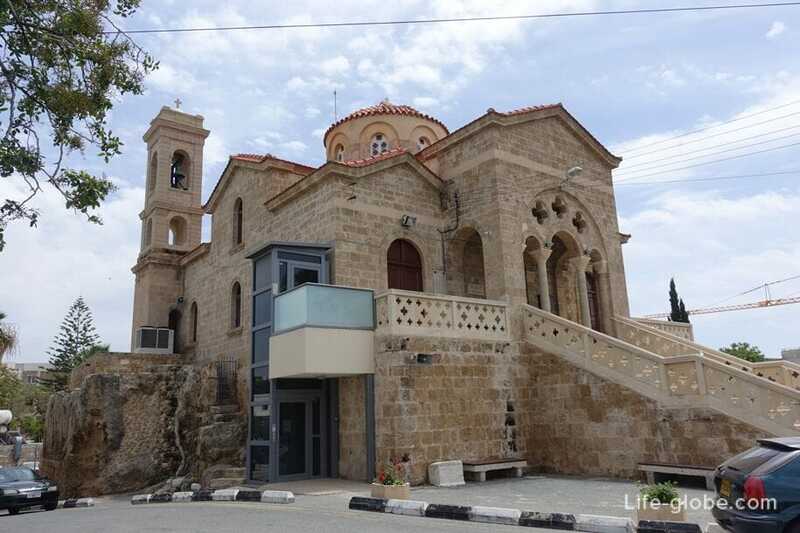 Kouklia is a small village with a rich history, located 26 kilometres from Paphos centre. 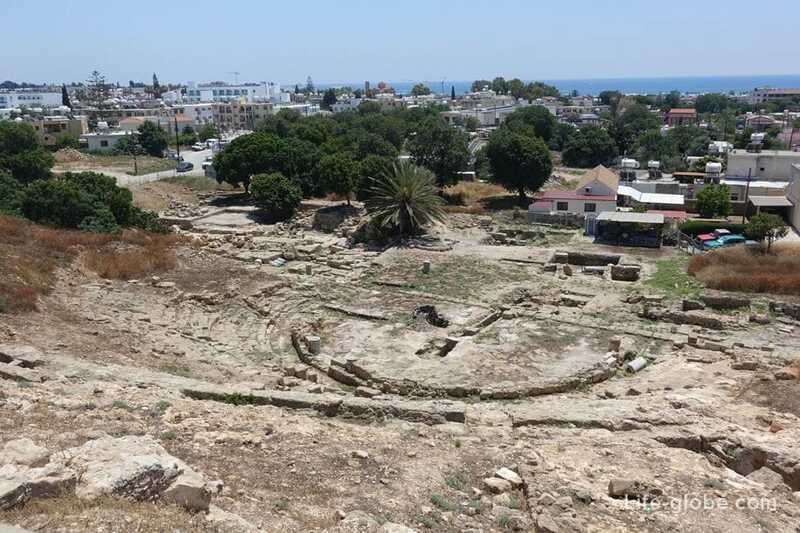 In ancient times it was the center of the island, called Paleo Paphos (Old Paphos). 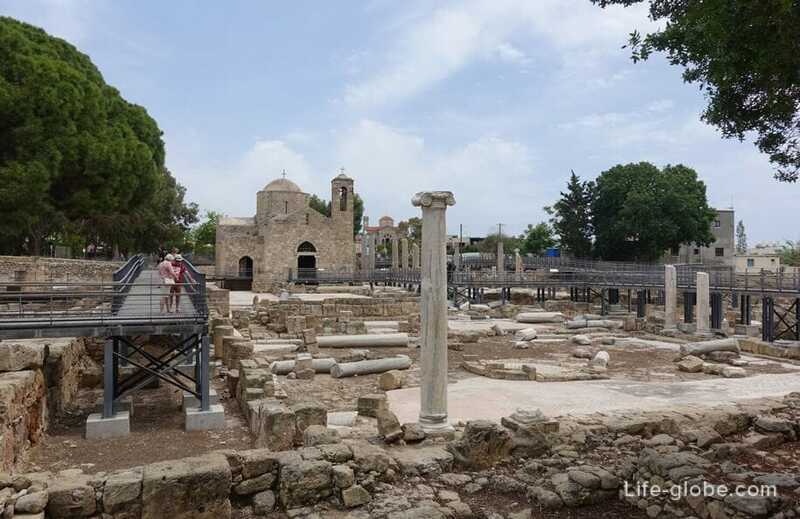 At present, the area of the village of Kouklia is a Museum under the open sky, whose main attraction is the ruins and the temple (sanctuary) of Aphrodite. 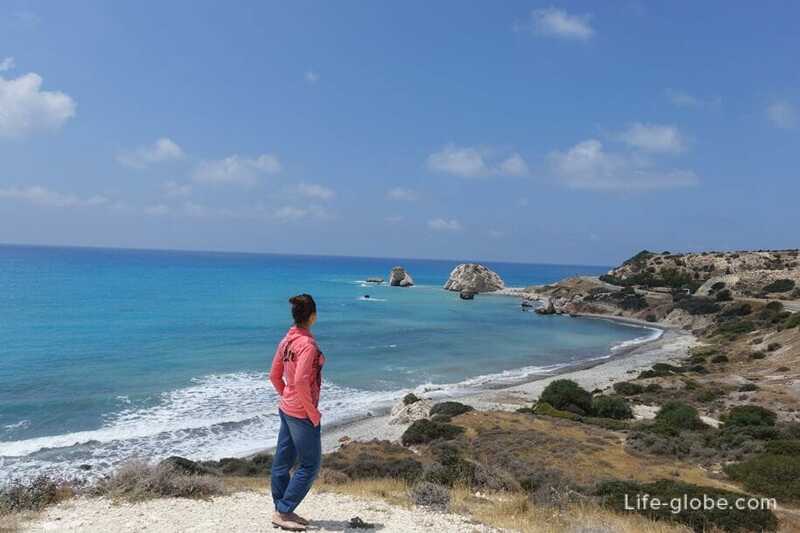 Also on the coast of Kouklia is another famous on the whole of Cyprus, landmark, legendary rock - the rock of Aphrodite. 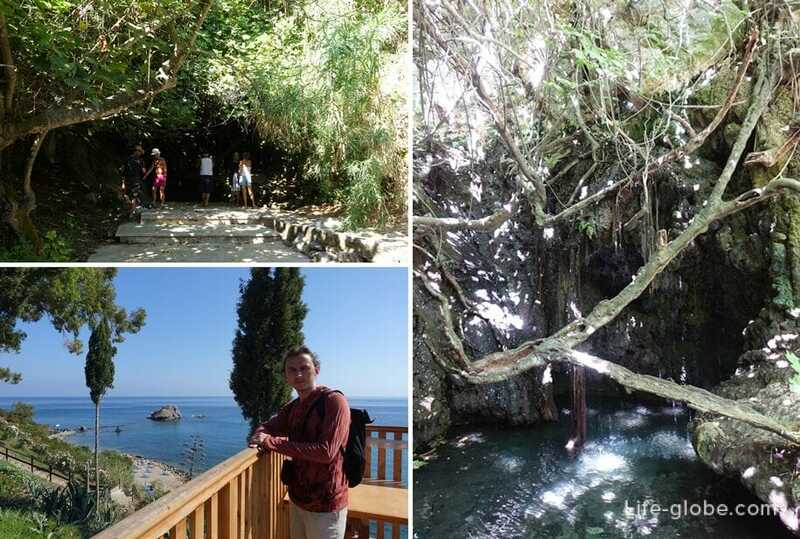 This area is associated with several legends, which essentially boils down to one thing - this stone is the birth place of the beautiful maiden emerging from the sea foam goddess of beauty and love Aphrodite. Baths of Adonis (Adonis Baths), is located 4 kilometres from the centre of the village of Koili in the 15-17 kilometers from Paphos Harbor. Data bathing are also related to the Cyprus legends and beliefs. Baths represent a natural pool. The entrance fees. 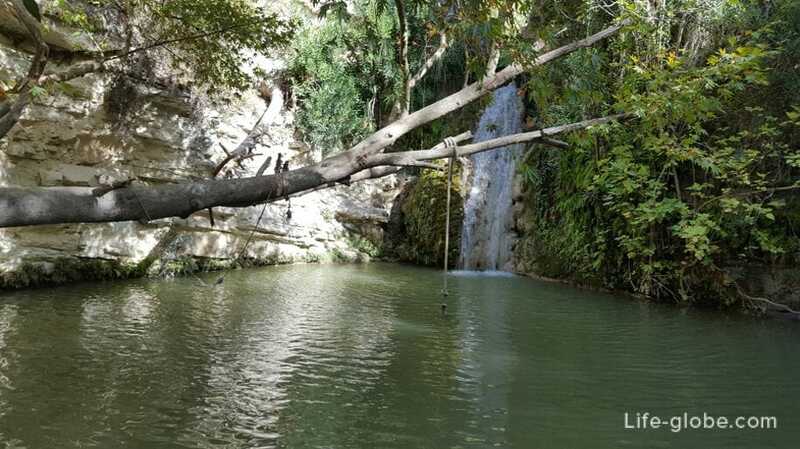 Avakas is not just a natural attraction but also a place for active Hiking. The nature reserve of the Akamas Peninsula - natural landmark of Paphos district, located closer to the Polis - is westernmost point of Cyprus. Lara beach is located North of the coast of Paphos, Peyia is higher. Although this beach is quite remote and rarely visited, but here you can enjoy the natural wealth and privacy. The beach is surrounded by the places where sea turtles lay their eggs, for the same reason, this beach called "Turtle beach". 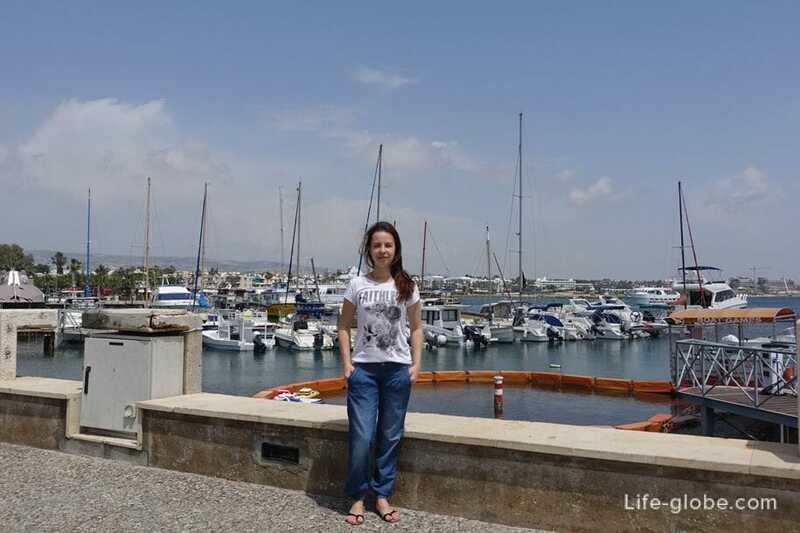 The most interesting and popular place in the area of Polis is a beach resort, a fishing and holiday village - Latsi. 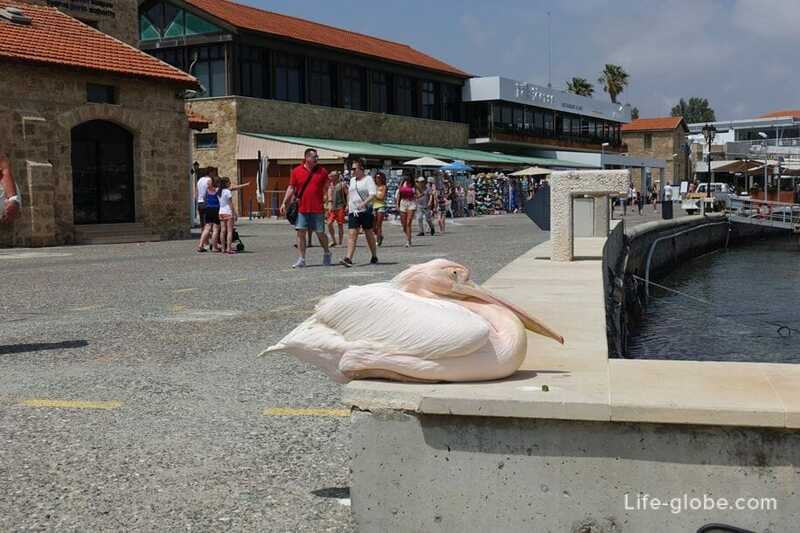 Latsi is famous for its fish taverns, the picturesque coast, the beach and the Marina. The water Park is Paphos (Paphos Waterpark) - the largest water Park in Paphos located in Geroskipou. Rides: free fall, kamikaze, Twister, wild water, crossover, super volcano, family rafting, wave pool, relaxation pool and Jacuzzi. It is also possible a trial scuba dive. Official site. Luna Park (the amusement Park Paphos) is a small amusement Park located in Geroskipou, at the address: Poseidonos Ave 1, Paphos, Cyprus. 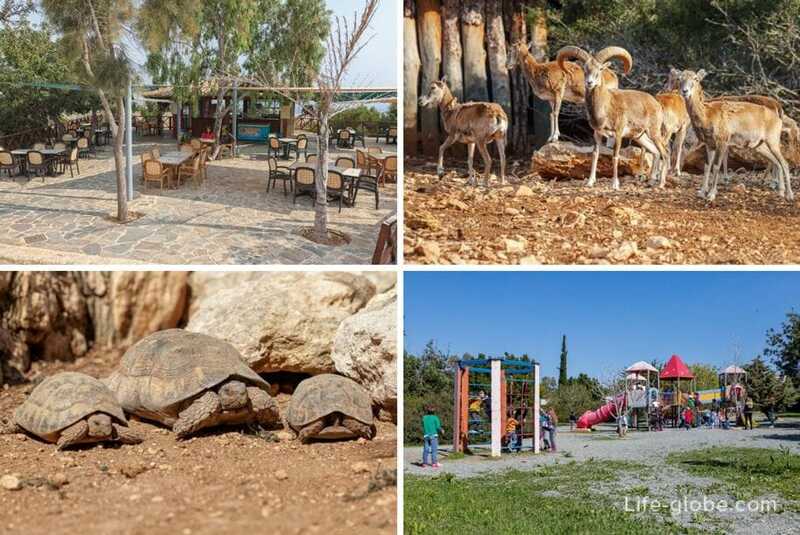 Zoo Paphos (Pafos Zoo) - the bird & animal Park, located in the Northern part of Peyia. Official site. The Park is located in the village of Anarita, in a relatively small area, near the village of Mandria, South-East of Paphos airport. The name of the Park "Eleouthkia" means "olive trees", and was chosen due to the fact that for many years in Anarita were olive groves. Botanical Park occupies a large area of 20,000 square meters, there are 10 thematic gardens, which are nearly 55,000 plants and flowers from around the world, as well as some plants of Cyprus. 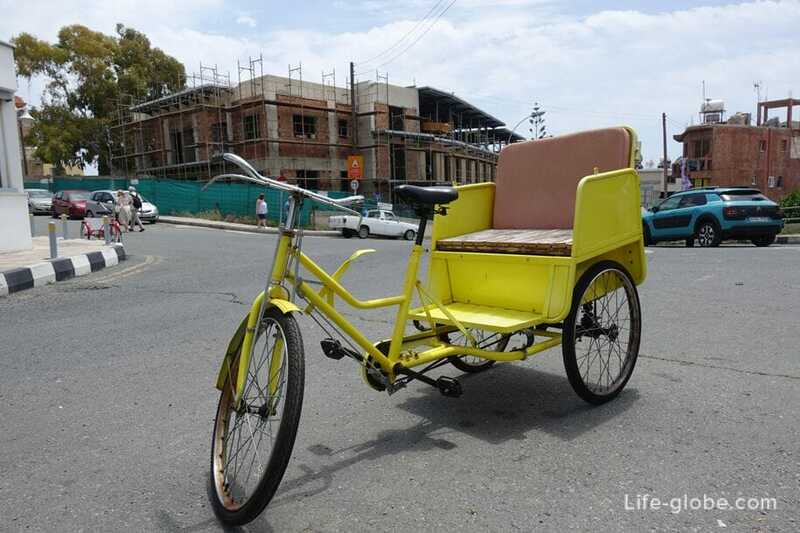 There is also a cafe, two playgrounds, a Museum and gift shop. On-site weddings and celebrations. Official site. Park "Cyprus land" is a theme Park located in Limassol, 77 kilometres from the centre of Kato Paphos. 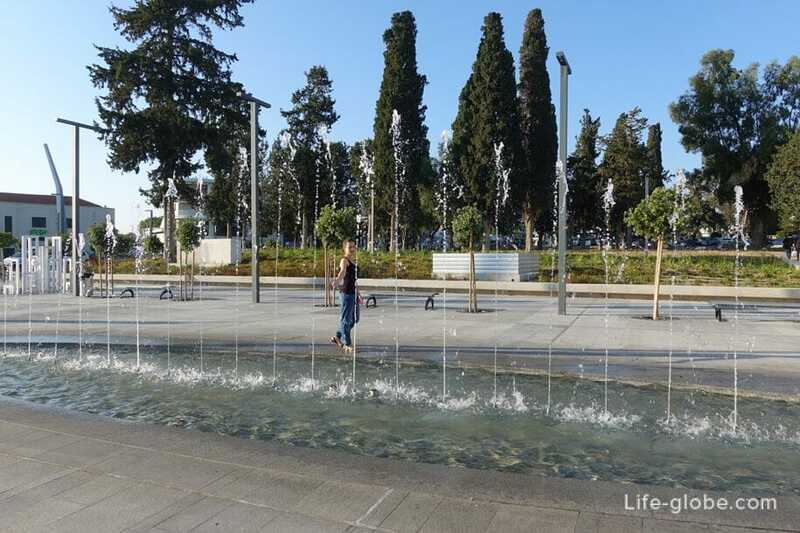 In the Park you can get acquainted with the history, culture and traditions of the island of Cyprus. 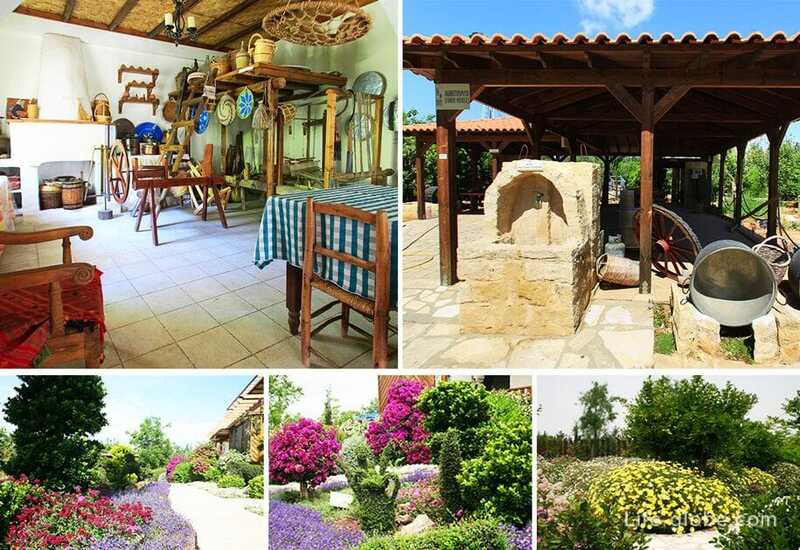 In the Park there are workshops of traditional Cypriot crafts, to manufacture tools and household items, lace, mosaic, pottery, glass, olive oil and honey. 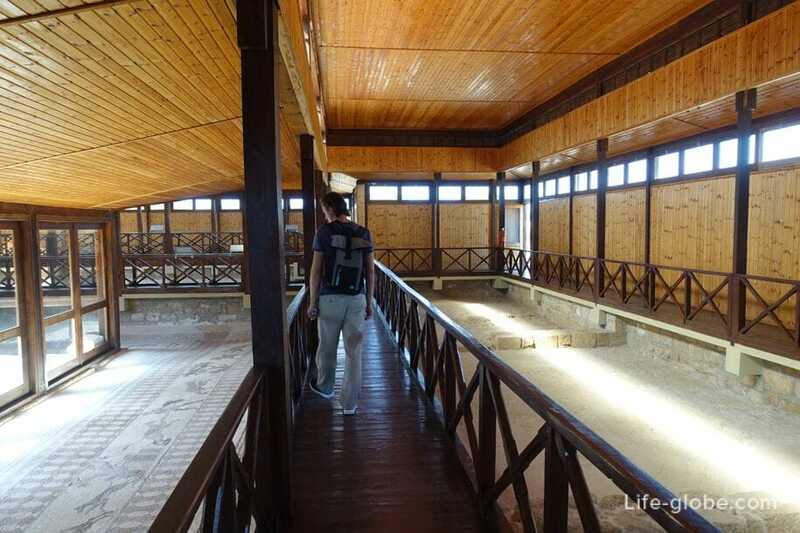 The centre of the Park is the exhibition dedicated to the history of Cyprus. Also in the Park you can practice archery, watch a short jousting battles, café or take part in professional workshops. Official site. The city's many selling points of the city. 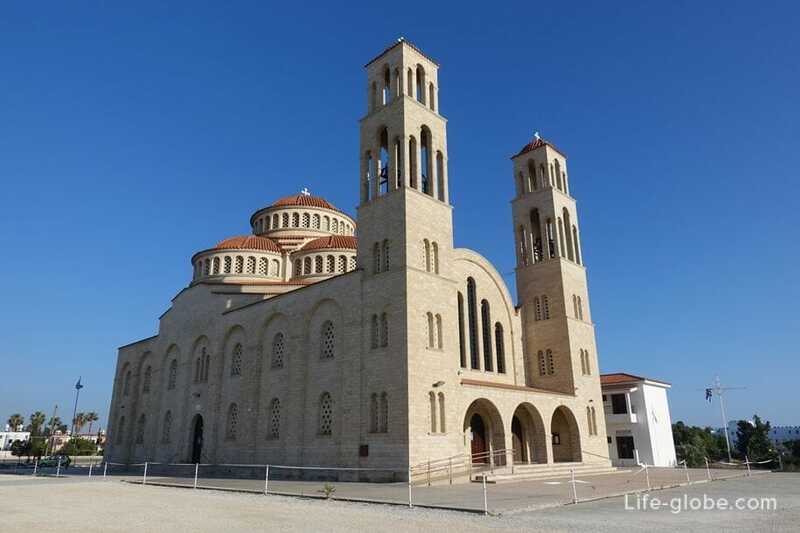 Based plenty of fun - all sorts of excursions in the area of Paphos and the island of Cyprus, a survey of architectural, historical and natural attractions, and a visit to the monasteries of Cyprus. A lot of popular boat trips and cruisesduring which you can see the beaches and coves of the area Paphos, or other parts of Cyprus; to go to sea with the purpose of swimming or fishing, and also swimming in the famous Blue lagoon or take a cruise with the purpose of turtle watching. The most popular dish is the Meze. Meze is a set of various snacks and small meals is also a great option to try several Cypriot national dishes in one sitting. 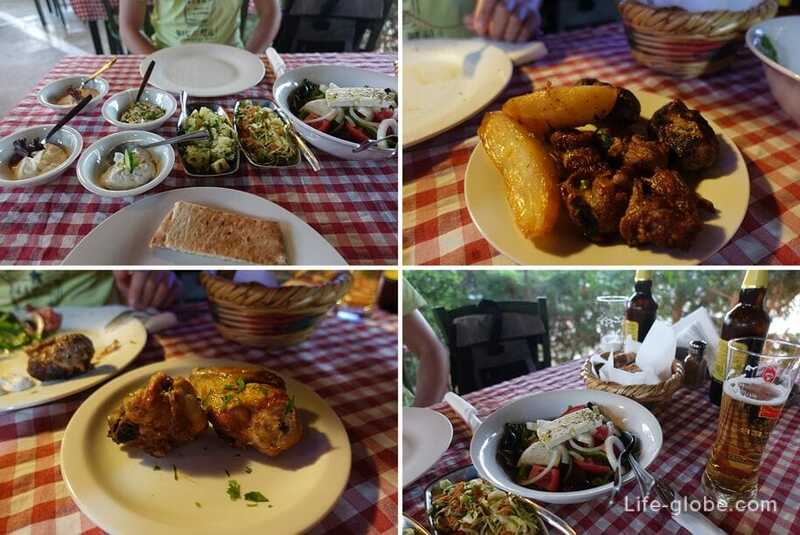 So, depending on the restaurant, the meze can have different variations of dishes. 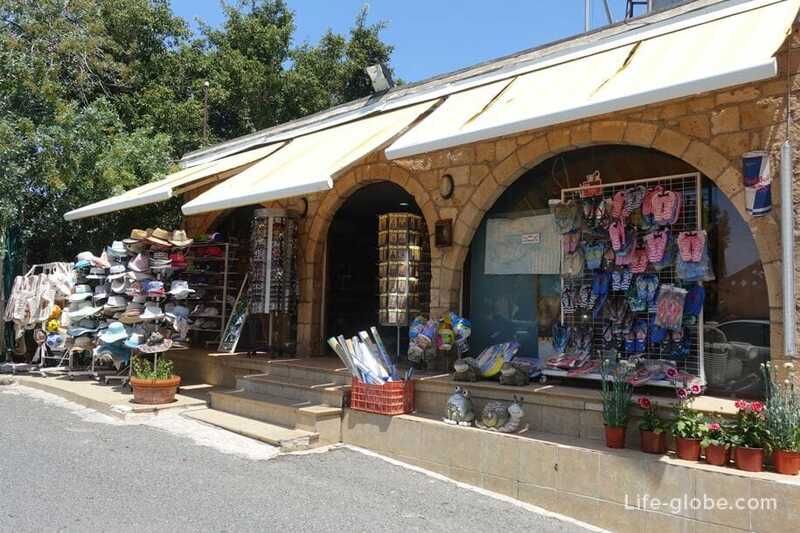 In the centre of Kato Paphos a lot of small boutiques and souvenir shops. 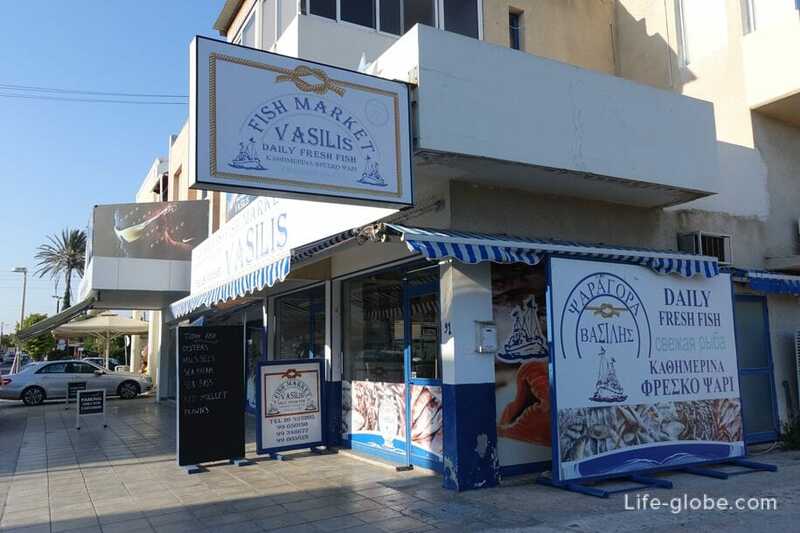 Shopping Mall with food court and large supermarket on the ground floor located at the address: Corner St. Paul & Tombs of the Kings 2, Paphos 8046, Cyprus, one kilometre from the bus station to the Harbor. 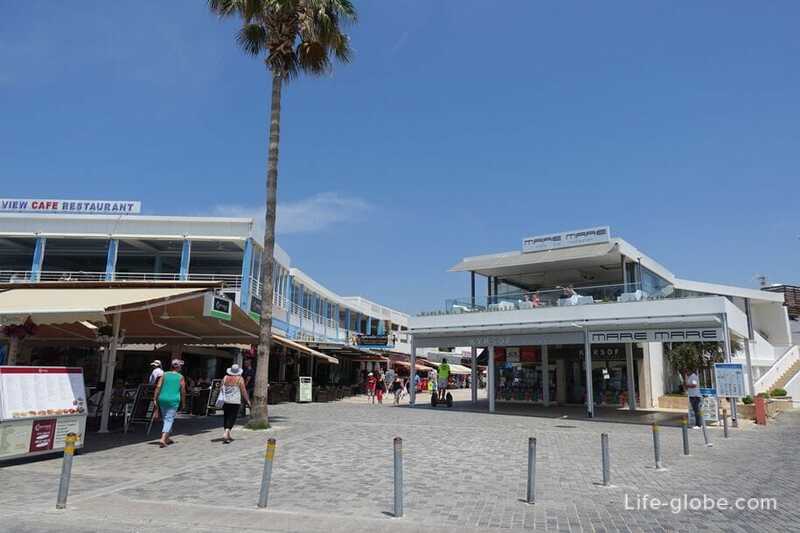 It is the only major shopping Mall in Kato Paphos. 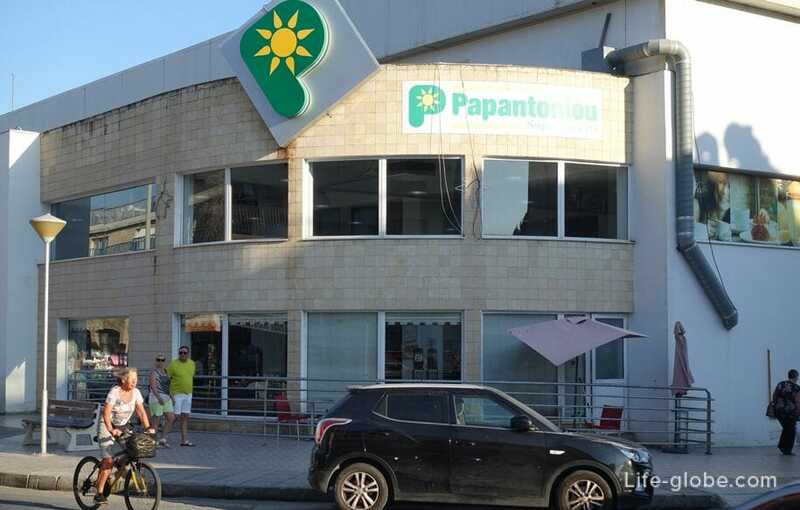 Papantoniou Supermarket Kato Paphos, located at 4, Lidas Street, in 200 metres from the bus station to the Harbor. 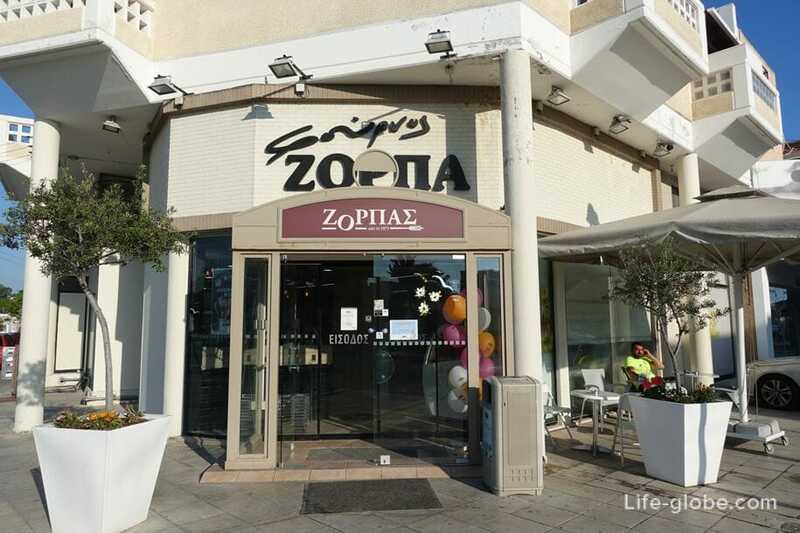 For lovers of cakes and pastries in the heart of Kato Paphos, within 450 metres from the bus station Harbor, the street Apostolou Pavlou Ave there is a good bakery Zorbas Bakery. Next to the bakery is a small fish Market, which sell fresh fish and seafood. Opened in the first half of the day. 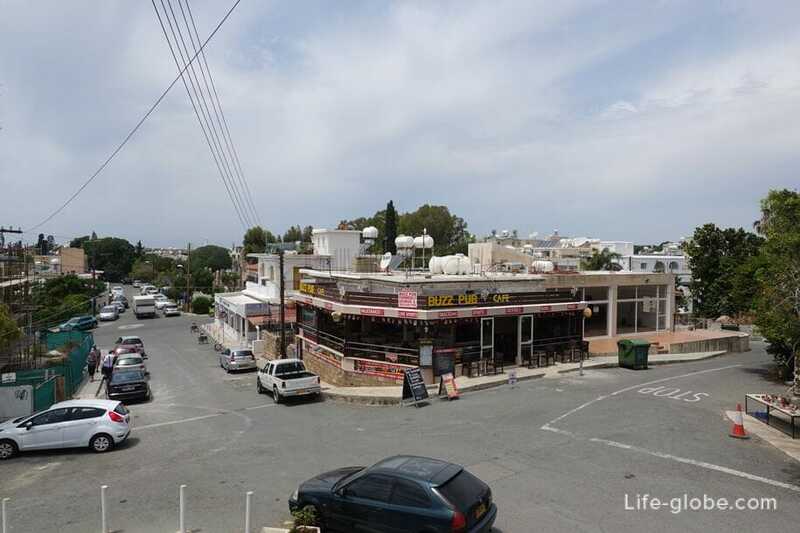 In the Upper Paphos there are more supermarkets and shops, a special place among them occupies travel duffel Municipal market of Paphos (Pafos Municipal Market / Δημοτική αγορά Πάφου). 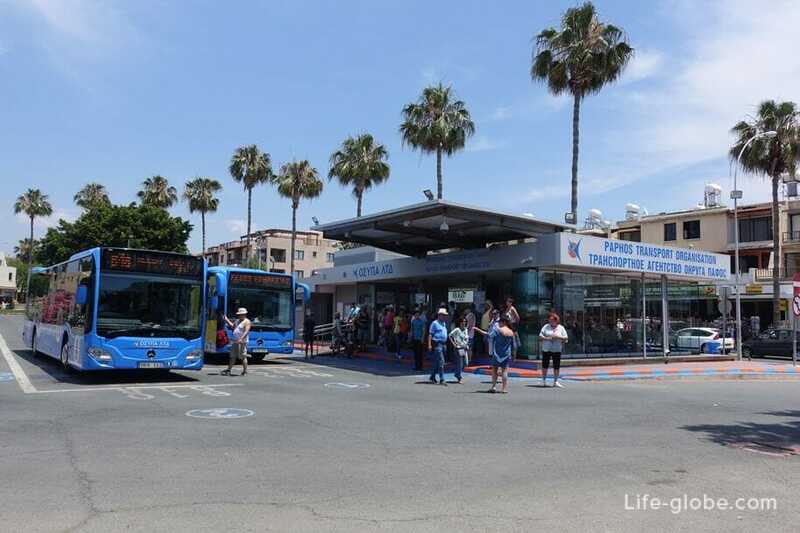 Of Kato Paphos, the bus station, the Harbor, can be reached by bus 610. 603В bus, bus station Harbor, runs to supermarket Alphamega, with a large range of products and manufactured goods and household chemistry. The only public transport to Paphos and the surrounding area - buses. 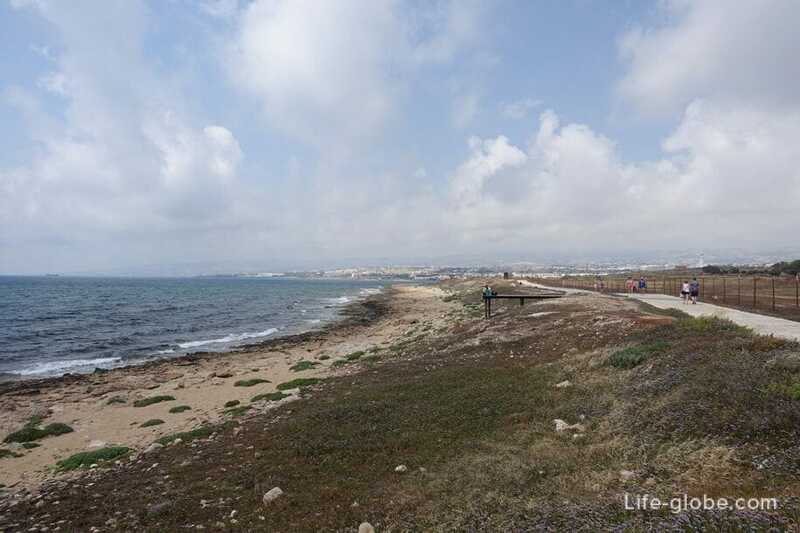 On the Lower and Upper Paphos, you can easily move on foot. 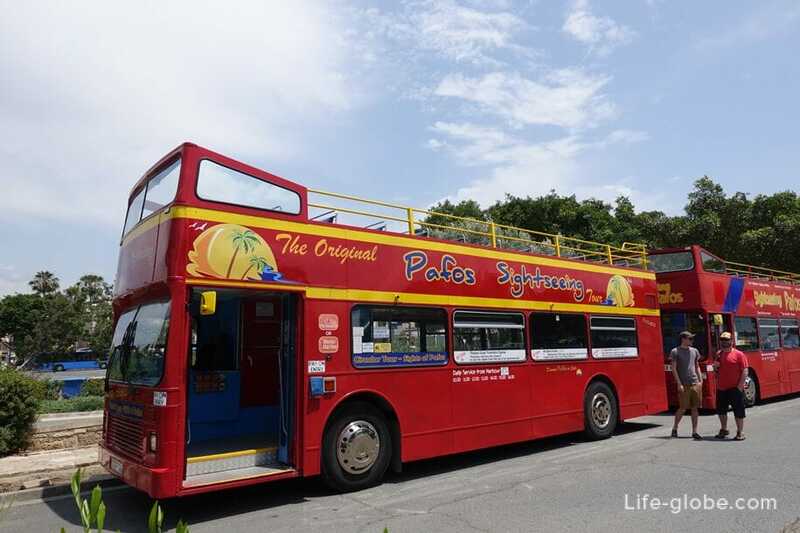 Bus message of Paphos are well developed, to visit almost all the attractions of the surrounding area of Paphos can be on the bus. The city has two bus stations: the Harbour located near harbour and Karavella, located in the heart of the Upper town, 3.5 kilometres from the coast. 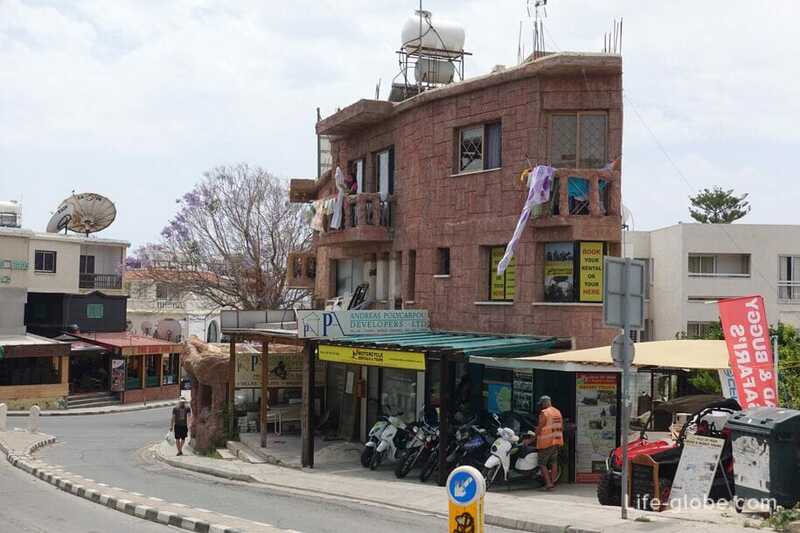 The choice of accommodation in Paphos is very large and diverse, here you can find accommodation for every taste and budget, from budget to luxury 5 star hotels, boutique hotels, apartments and villas, located near the beaches and the centre of Kato Paphos, and more remotely from those. 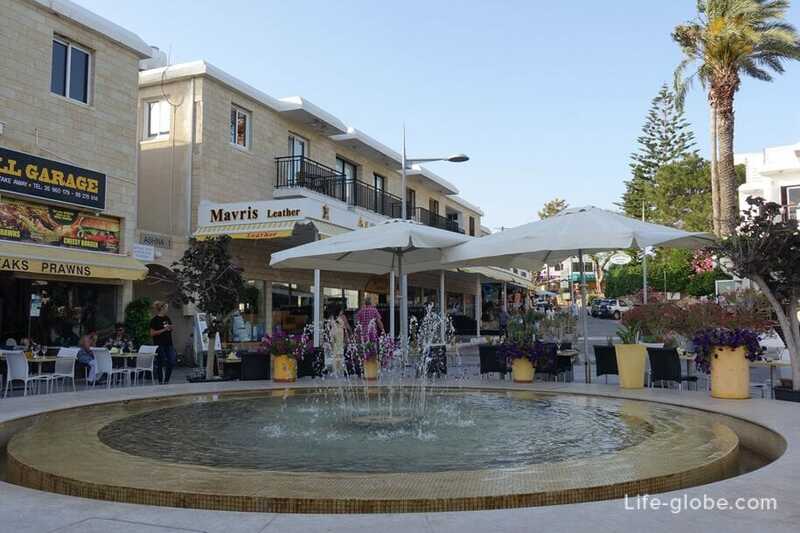 All means of accommodation in Paphos, from budget to luxury, you can view and book here. 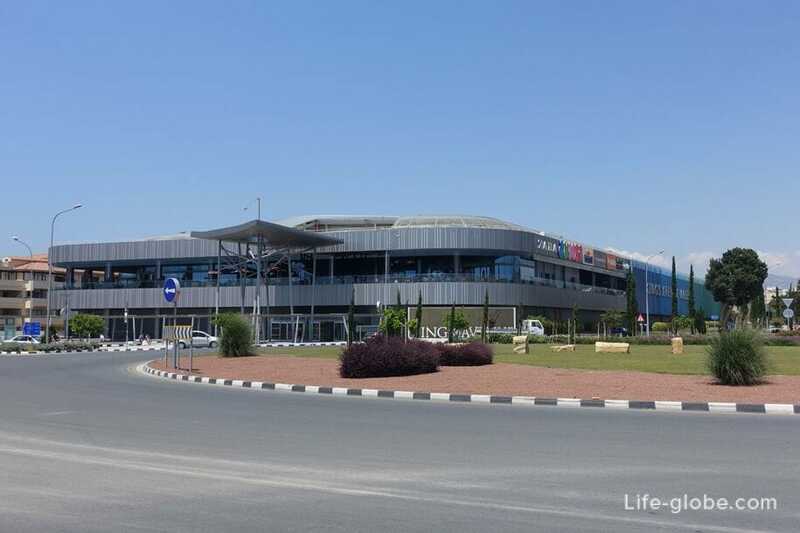 Paphos International Airport is a modern international airport, located 13 kilometers to the Southeast from the tourist center of Paphos (Kato Paphos). Paphos airport regularly sends and receives flights from cities in Europe. At the bus station Harbour bus 612. The Karavella bus station - bus 613. - bus Karavella, 08:00 am to 19:00 PM, with a break of one and a half to 2.5 hours.